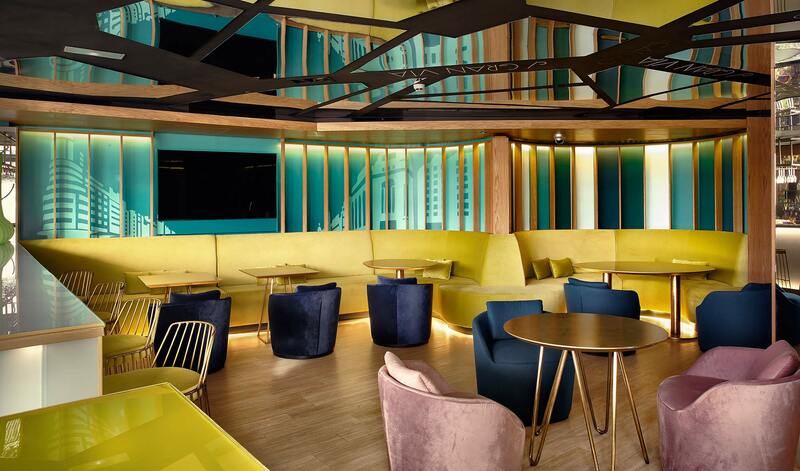 Hotel Indigo Madrid Gran Vía will be undergoing a renovation of its Lobby, Skylounge and terrace from 28th January to 30th April 2019. During this time, service excellence will remain our focus and our team will ensure that your stay in our hotel will not be affected. 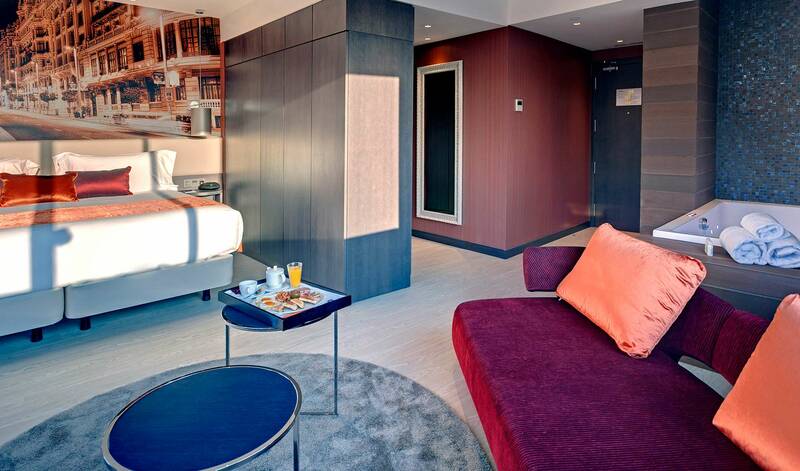 There will be minimal disruption to guest comfort as works will be limited to daylight hours. Apologize for the inconvenience. 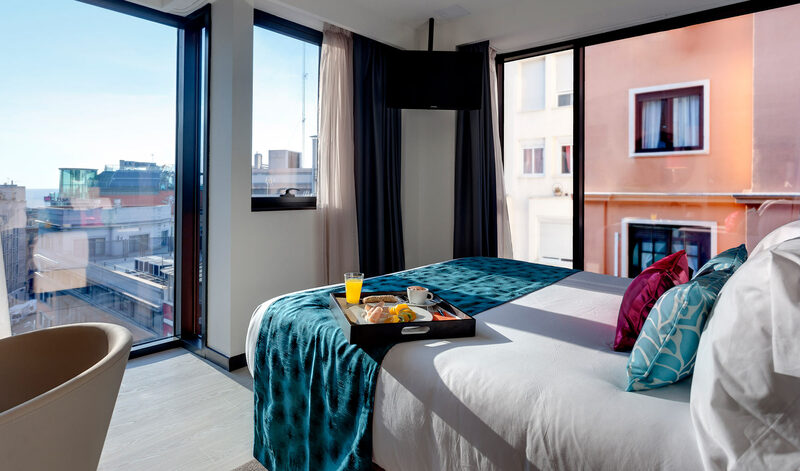 Located in the heart of the city, the Hotel Indigo Madrid - Gran Via is just a few steps from the epicenter of urban life and the most modern, vibrant and cosmopolitan avenue of Madrid. 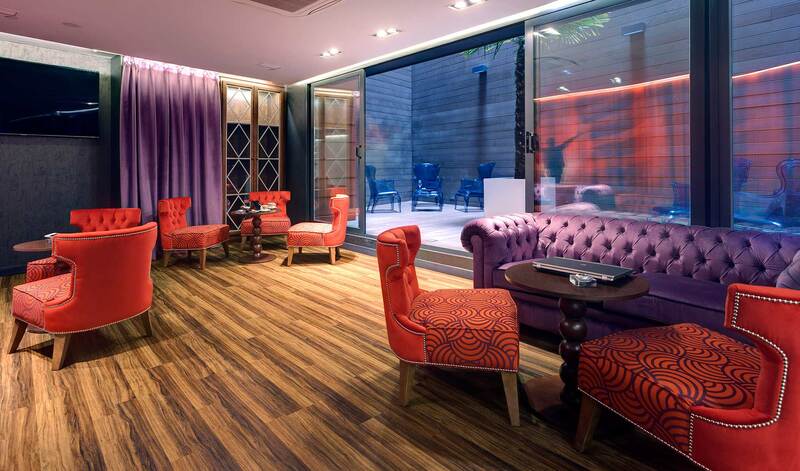 Tucked away on the peaceful street of Calle Silva off of Gran Vía, you’ll find Hotel Indigo Madrid – Gran Via. 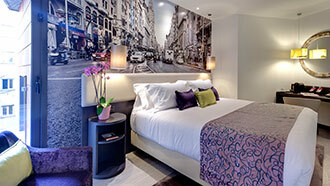 Upon arrival, you’ll notice that our hotel is immersed in the same vivacious spirit and as our neighborhood. Whether coming for leisure or business, you’re sure to feel right at home. During every Sunday January from 20th, February and March, the restaurant El Gato Canalla Hotel Indigo Madrid Gran Vía offers for the second consecutive year, for all lovers of good gastronomic tradition: Sunday cooked and nap! An exquisite menu of typical Madrid stew, cooked from tradition but with modern touches that ends with a deserved nap in a hotel room, for 2 hours, for only 45 €. 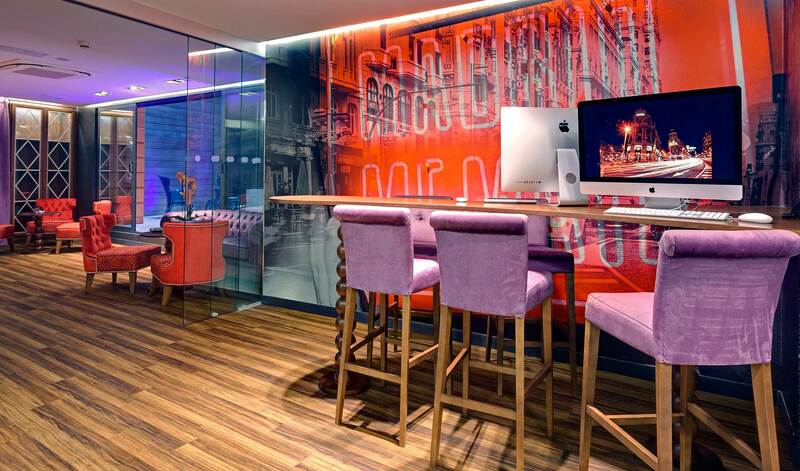 The hotel offers a 24-hour Business Centre with iMac computers and color photocopier, free for clients. Disponemos de garaje privado al lado del hotel.  Internet gratuito para todos los huéspedes, en habitaciones centro de negocios, áreas públicas y meeting Spaces. Guide dogs and assistance animals are allowed, please call in advance. 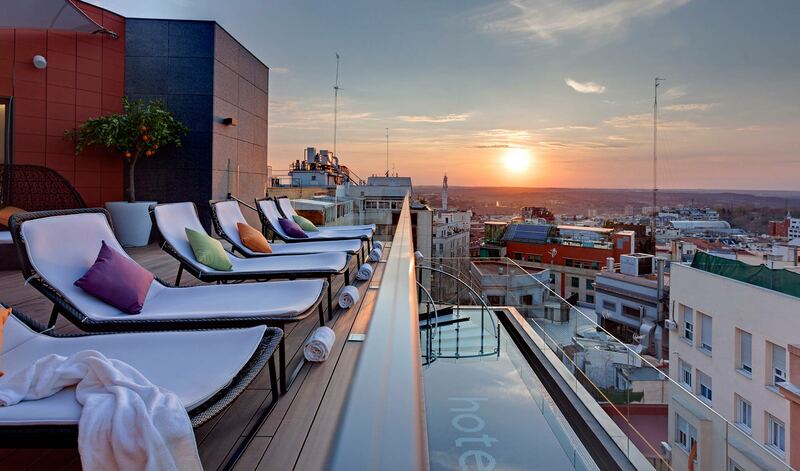 Almost touch the sky and take in the beautiful Madrid skyline from our rooftop lounge and bar. 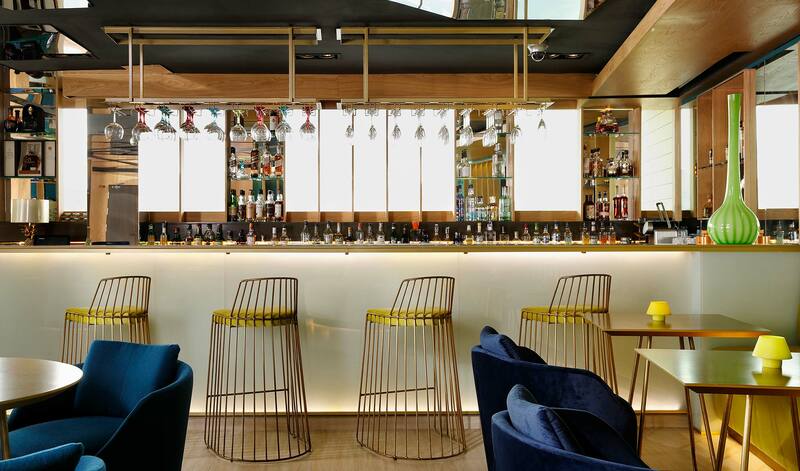 As our hotel is West-facing you can also enjoy the beautiful sunsets in Madrid while sipping one of our delicious cocktails. 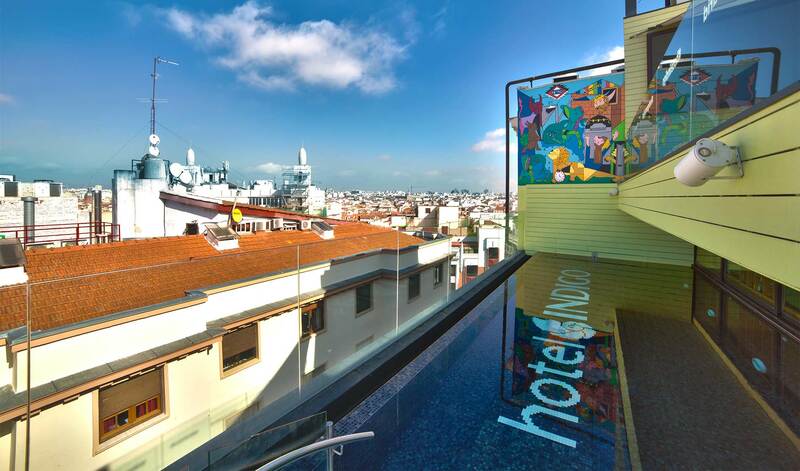 Enjoy our unique and exclusive Infinity Pool in central Madrid. 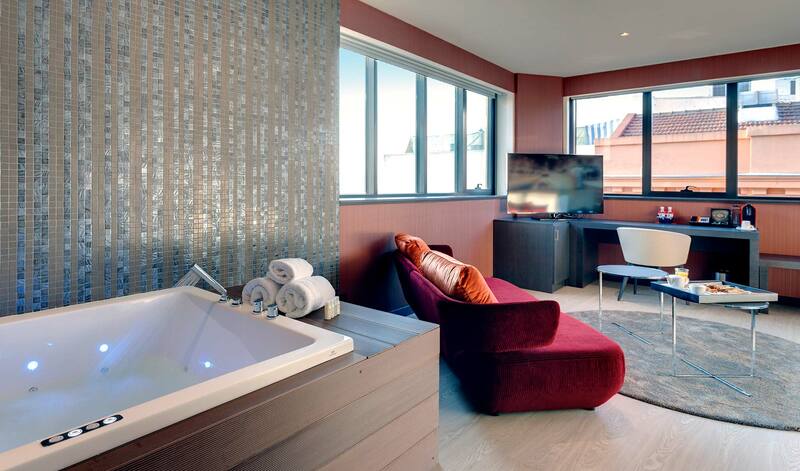 Take a refreshing dip and delight in the amazing views of the city that never sleeps. Seasonal open daily from 10am to 8:30pm. Free towel service. Snacks, cut fruit and delcious Jamon Ibérico also available. 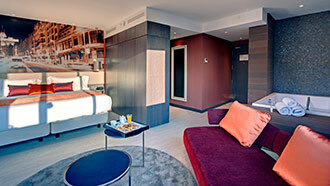 The design of Hotel Indigo Madrid - Gran Via was inspired by the historic avenue of Gran Vía, a classic and buoyant street created in 1910. This beautiful avenue has been the backdrop for many films, progressive protests and an inspiration to countless songs. 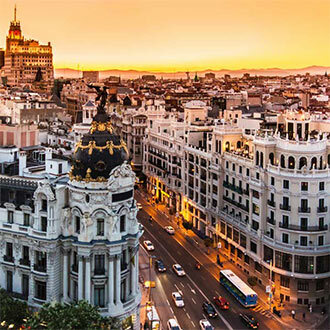 Gran Vía has played with new ideas, new releases and new movements throughout history - from the installation of the first metro line to the Opening Nights of Almodóvar films, Gran Vía has seen it all. In fact, it’s life has been a succession of impressive innovations: from the first department store in the city to the first public telephone booths, air-conditioned buildings, metro line and even the construction of one of the first skyscrapers in Europe! The innovative spirit of Gran Via is very important to us, and you will see that we capture these characteristics throughout our hotel. A partir de las primeras horas de la tarde, los restaurantes de la Gran Vía están a tope: Los madrileños van al Mercado de la Reina ubicada en el número 12 para comer pimientos de padrón y la mejor tortilla de toda la ciudad. Después de comer, llega el tiempo para los negocios más importantes del día: las compras. La Gran Vía es la primera y más importante calle de establecimientos de moda de la capital, y sus aceras están llenas de tiendas de las mejores marcas ubicadas en edificios históricos. En la Gran Vía se puede encontrar con tiendas conocidas en todo el mundo o marcas locales. Por ejemplo, en el número 26 está el palacio de moda Custo, una vanguardista marca española de alta costura con precios asequibles. En el número 10 se encuentra la perfumería Rosi, donde se pueden adquirir elegantes perfumes. 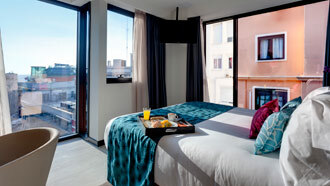 A la vuelta de Hotel Indigo Madrid – Gran Via en el número 60 esta Lurueña, que se especializa en zapatos y bolsos hechos a mano, y en el número 49 Blanco, donde se pueden encontrar lo último en moda prêt-a-porter. Cualquier cosa que esté buscando la puede encontrar con seguridad en una de las muchas tiendas de la Gran Vía. At night when the neon lights of Capitol building light the sky, Gran Vía cinemas open their doors to fans waiting to see new releases from their favorite actors like Penelope Cruz and Javier. 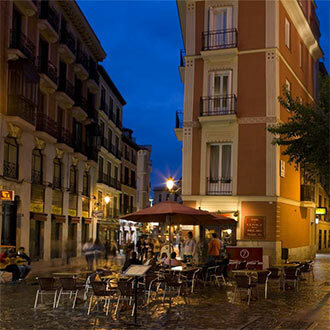 With work finished for the day, locals go out for dinner or drinks on the main and back streets of Madrid. Chueca, a neighborhood adjacent to Gran Vía, attracts many people for its intimate bars and nightclubs, and is known for fighting for the rights of homosexuals in the city. Each year Gran Vía is in the center of Gay Pride celebrations where the streets are filled with colorful flags and people dancing on floats. You’ll find this area to be a proudly liberal district fighting for what it believes in. The party continues all through the night on Gran Vía. 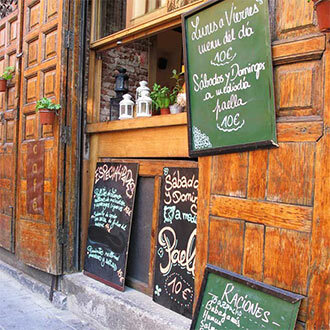 Cafes and restaurants that are open 24 hours never have a slow day (or night) and street musicians entertain the revelers on the pedestrian street of Plaza de Callao. 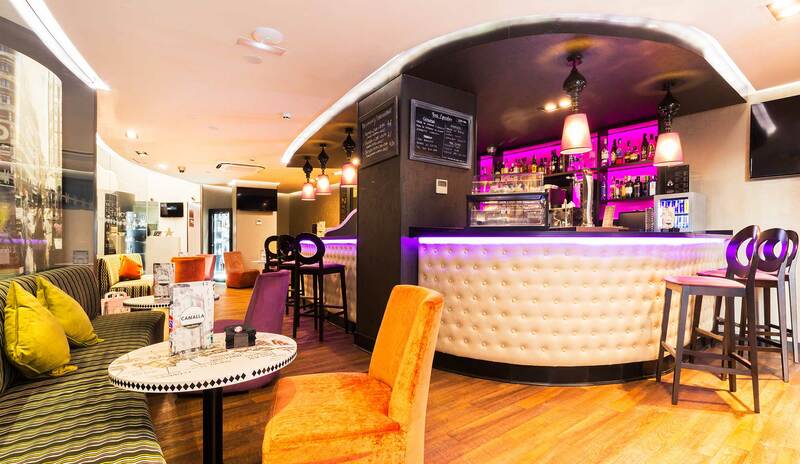 Gran Vía is full of life at any time of day, and at Hotel Indigo Madrid - Gran Via you will find a warm welcome no matter what time you arrive.